D. Naujoks, Y. M. Eggeler, P. Hallensleben, J. Frenzel, S. G. Fries, M. Palumbo, J. Koßmann, T. Hammerschmidt, J. Pfetzing-Micklich, G. Eggeler, E. Spiecker, R. Drautz, A. Ludwig. Reprinted from Acta Materialia, Vol 138, 100-110, Copyright (2017), with permission from Elsevier. The formation of a ternary μ-phase is documented for the system Co-Ti-W. The relevant compositional stability range is identified by high-throughput energy dispersive X-ray spectroscopy, electrical resistance and X-ray diffraction maps from a thin-film materials library (1 μm thickness). Bulk samples of the identified compositions were fabricated to allow for correlative film and bulk studies. 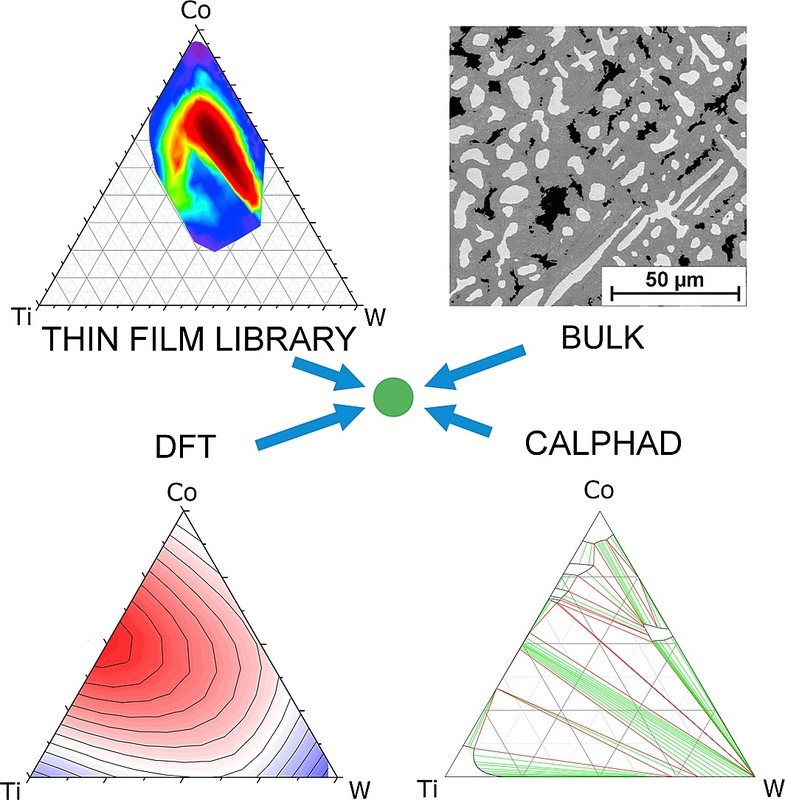 Using analytical scanning and transmission electron microscopy, we demonstrate that in both, thin film and bulk samples, the D85 phase (μ-phase) coexists with the C36-phase and the A2-phase at comparable average chemical compositions. Young's moduli and hardness values of the μ-phase and the C36-phase were determined by nanoindentation. The trends of experimentally obtained elastic moduli are consistent with density functional theory (DFT) calculations. DFT analysis also supports the experimental findings, that the μ-phase can solve up to 18 at.% Ti. Based on the experimental and DFT results it is shown that CALPHAD modeling can be modified to account for the new findings.